My last race for the year! It's one I've done before. It's a free race with timing and goodies at the end including free giveaways put on by Runnin' Gear and Rotpac Racing. How awesome is that? It's a bonus it's on trails too. I ran a personal worst since I ran a nine mile training run prior to the race. The effort was hard but the results are slow. Make sure you do this race if they do it again next year. It's better than some paid races I've run. Registration was just e-mailing the company your information and you were in the race. That simple. The race was at Independence Oaks Park so my buddy, Dave and I headed over at 8am to get in some trail miles before the race started. Wow is this area hilly. I ran the race last year and the race itself is not as hilly as the hills we faced before the race. This is a great area to do some hill training. You went into the twin chimney building and they had a couple fires going in the fireplace. They had things set up so you signed in and signed a waiver as well as picked up a bib. With that we were ready to race. The race had some homemade goodies to eat for after the race. How nice is that given this is a free race? They were also selling tech shirts for $15 which is a good price considering they are Brooks brand shirts and very nice. I didn't get one because I need another tech shirt like a hole in the head. With Dave and I getting in some extra miles before, we had a great view of the lake. After we got in 9 miles, we came back into the building and stayed warm until it was ready to race. The race was starting at 10am. The course is a loop course with some wide track, single track and double track. It's a very nice area to run. It was pretty brisk this morning. You can see the Map below. I recorded the race on the Bryton Amis S430 GPS watch that I'm testing and will have a complete review of it next week. The watch shows it recorded 3.11 miles - a great job on the part of the race management. The watch has always been quite accurate when it comes to distance for the past month or so I've been using it. Below you will also see the splits that I did. As I said, pretty slow for my typical 5k race but with 16 miles the day before and 9 miles before the race, my legs were toast by the time we started racing. One thing I am proud of is that I was getting faster near the end of the race. Note: When I take pictures during the race, I typically don't change my pace or stop in the interest of safety. If I do stop, I always move to the side. I just keep running and I get what I can get from the pictures. Some come out better than others but they give you a great idea of what the course is like. We all headed out to the start line at 10am which was very informal and there was no timing mat to go over at the start. They just said go and we were off. The first part of the course is located on asphalt trails. Very quickly into the race, we changed over to trails. It was a little crowded to start off but the crowd thinned out quick enough. Lots of people were dressed with Christmas stuff on. 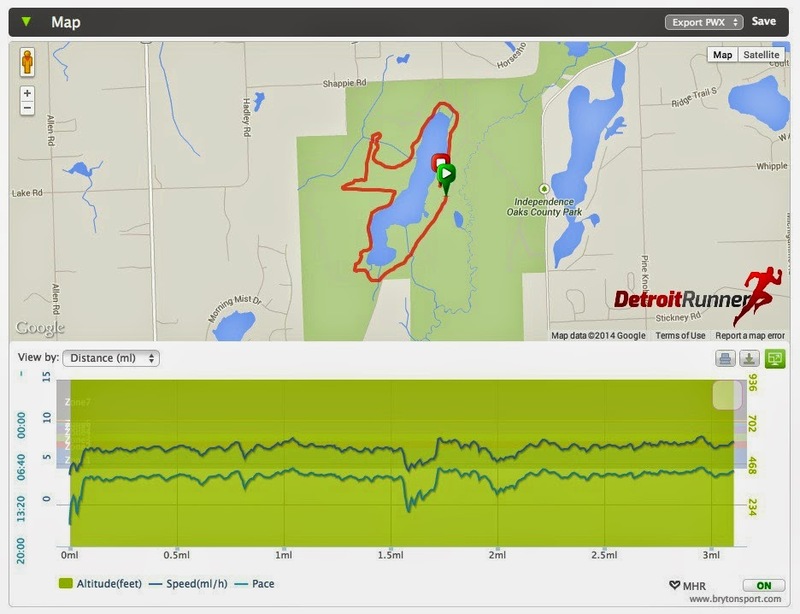 The portion of the trail by the lake is, by far, my favorite part of the course. It was just cold enough the lake was barely frozen over and looked really cool. Shortly after, we started to head into some of the hills and ran on a nice grassy area. The largest hill showed itself. Check that out! Ouch that was hard getting up this one. I wish I had brought my camera to show you the rest of the hills we race before the race. With the main hill passed, we were starting on the downhill which made for a little speedier part of the race. As you can see, some people brought their dogs too. Next up was the single track area. There were tons of leaves on the course and almost hard to see where the trail went. The ground was nice and cushy and made for great running. After a short area on the single track, it was back to the wider trail to finish out the loop around the lake. The final portion was back onto asphalt heading towards the finish. A huge Santa was there to greet us and the timing mats were there at the finish. The finish area was back at the twin chimney building right next to the finish line. 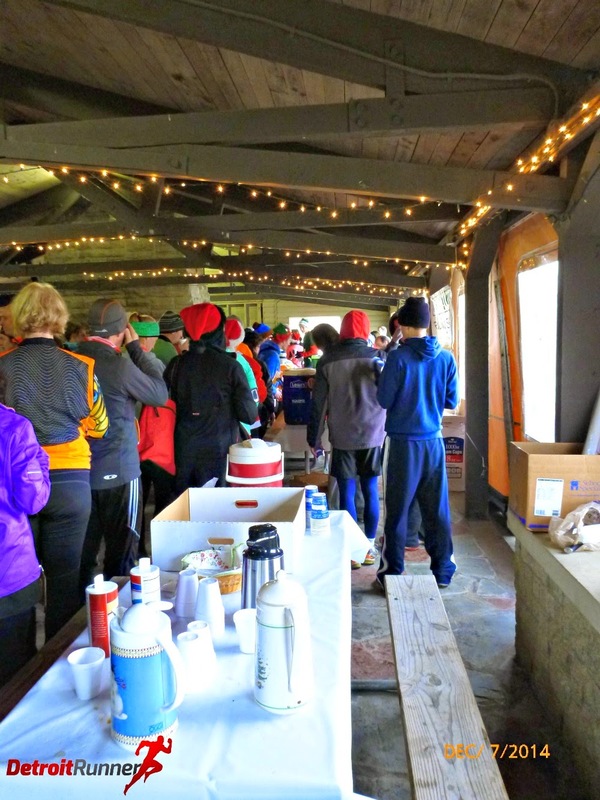 The race had some baked goods, granola bars, water, coffee and hot chocolate. 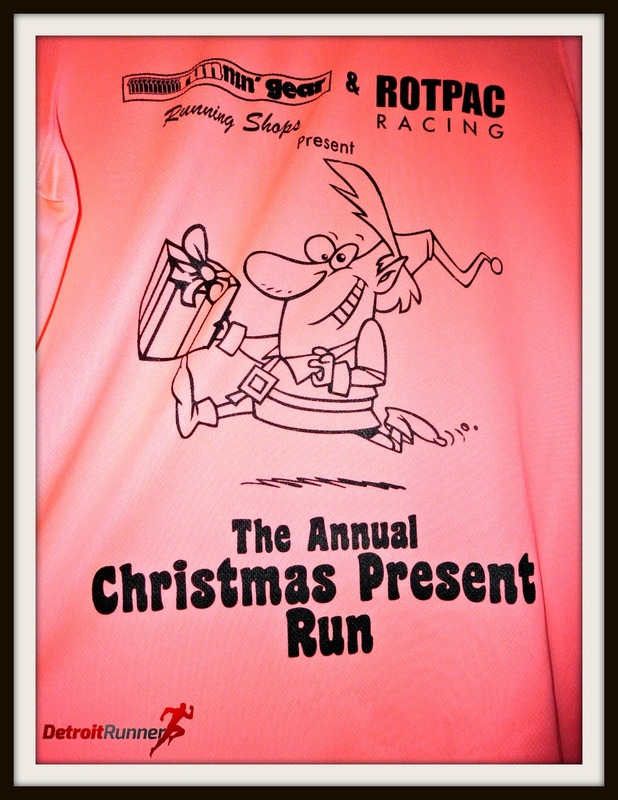 It was very generous of Runnin' Gear and Rotpac Racing to do this for the local runners. Runners were able to stay warm in the building as we waited for immediate results and for prize giveaways. Of course, because it was a free race, there was nothing included with signing up, however, they gave away some great running merchandise. They had five huge boxes of running stuff to give away and they basically threw it out into the crowd for people to get. For shoes, they asked that you pass them on if they didn't fit you. It was fun to see everyone trying to get free stuff. I was one of the lucky ones and ended up getting a free pair of shoes in my size! How awesome is that? Free pair of Adidas shoes in my size! Just like last year, this was very well organized. They could have charged for this and people would have come so it was a bonus that this was actually a free race. Great timing, course was well marked, volunteers were helpful. Very well done! Overall, I'd love to run this one again. Free is awesome and the trails are really nice. It's one to put on your list for next year and seems to grow each year. I hope they keep doing it every year. It's nice to do a free, no pressure 5k. Disclosure: This was a free race. All opinions are my own. I'm marking this on my calendar for next year!